Let’s just be clear here, I am not the pro. I am the tip-ee, as it were. 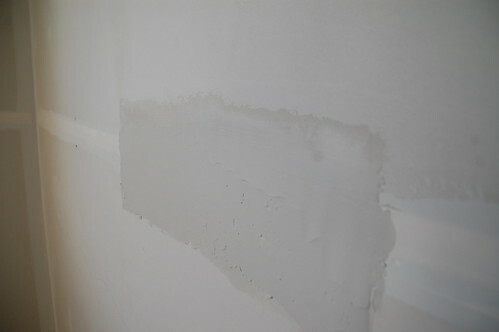 When the guy who hung the drywall and taped the joints told me we’d need to put the last two coats of mud on the drywall and saw my eyes get as big around as dinner plates, he took pity on me and gave me a little joint-finishing tutorial. This isn’t rocket science, but I’ll tell you that once I got the hang of this, these were by far the best joints I’ve ever done. 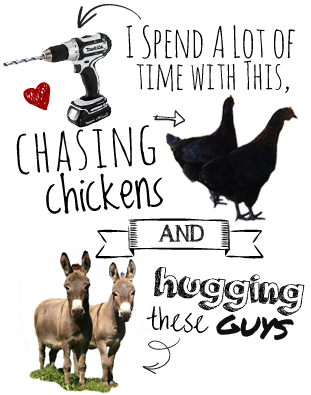 First things first… tools. MysteryMan hooked me up for Christmas, knowing there was a 2000 square foot house full of unfinished joints giving me the stink-eye. I’ve never owned a mud pan before, but this was invaluable for doing the screw holes and joints. I just wish they made a slightly smaller version (or one with a strap?) that fit my hand a bit better. My thumb still feels like its out of joint from 4 hours of finishing last weekend. Also, you need a 10″ knife. This was apparently one of my fatal-flaws before… using a 6″ knife that I thought was easier to handle. I don’t know why I always think the directions on the box are bullshitting me when they say things like “mix the mud before use”. It’s like my subconscious thinks the bucket of joint compound is somehow trying to screw with the number of minutes it’s going to take me to complete this task or something. I didn’t use a drill mixer… just did it by hand for a while, but you can tell even from the pictures how the consistency becomes looser and easier to work with. There was no adding water or additives, just a lot of mixing. 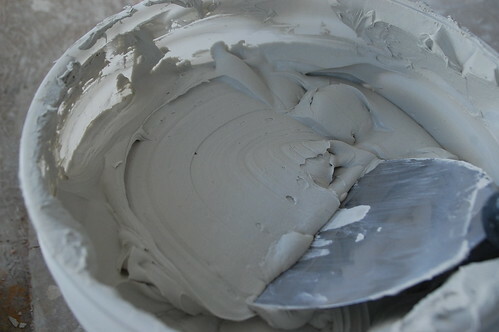 EDIT: After spending a weekend finishing joints with the professional, I learned that he preferred buying the joint compound in boxes (because it’s cheaper) and then mixing it in a 5 gallon bucket with one of those mixing augers and a little water (maybe a quart? )… his version was even easier to apply. The compound we used was a lightweight version. I’ve always been pretty conservative with how much mud I put on the seam, because like everyone else in the universe, I didn’t want to spend the rest of my life sanding it down. I know, you just fell over an died, right? Even seeing that much mud on a seam gives me sanding anxiety, however, the three swipe method is all about taking away the extra. First, “feather” the top edge by holding just the top edge of the knife tight to the wall. Then feather the bottom edge the same way. Finish it off by going over the whole joint with one smooth stroke. The seams should have a natural indent in them so there will be more mud in the middle of the seam than on the top or bottom. Also, don’t be afraid to go over it multiple times to make sure it’s smooth. I found it was best if I could do it the first time, but I could also touch it up okay if necessary. This was taken after it had dried for a bit, and you can see how thin the top and bottom should be. I did start in a closet so I could get the hang of it, and I definitely got my rhythm down after a while. These pictures were actually taken in the master bedroom. Another thing I found was that to get the mud to go on the wall easily, it helped if I picked it up and scraped it off the knife a few times using my pan. This was like another round of mixing and then it seemed to go on smoother. I also made sure to wipe both sides of the knife on the pan after every swipe. 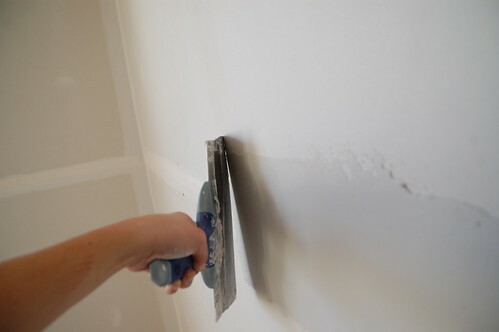 The hardest part I found was dealing with little drywall crusties that started to form as thin spots of mud dried in the pan that leave awesome swipe marks across your freshly smoothed joint. This was usually followed by an expletive on my part (feel free to use your imagination, I like to mix it up every once and while) and then MysteryMan rushing into the room to see if I cut my finger off with the drywall knife or something. Also, inside corners? Not my fave. Since I’ll be finishing most of the walls with a stucco/spanish knife texture, the one coat is probably good after its very lightly sanded. 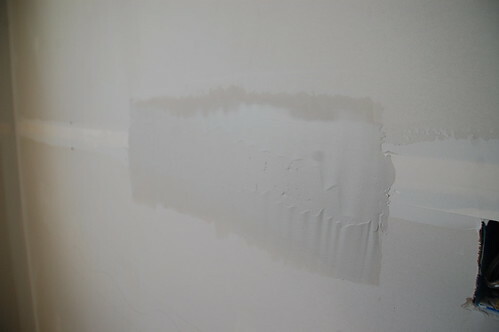 If you were going for completely flat walls, you’d probably want to do another coat just to finish things off. EDIT: A variation on the “three-swipe method is also great for finishing outside corners. All of your outside corners should have some kind of corner bead on them… I’ve used paper and plastic with mixed results, but our professional for this project used metal corners that are self-adhesive and also awesome. Very easy to use, very easy to finish. You put the mud on the same way (heavy), run the knife over the whole joint once to get rid of “fish eyes” (those little air bubbles) then feather the one edge, and finish with a final swipe down the entire joint. If I ever have to do this again, I’m finding a place that will rent out drywall tools like that. You can’t beat it. Because I am a person who has amassed crusty half-rusted drywall and putty knives like old ladies collect cats, this last thing I learned –while seemingly obvious– has eluded me for the last five years. Here it is, are you ready? 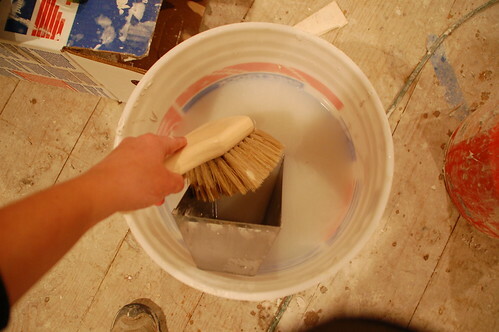 Keep a water bucket with a brush in it handy. Except, like me, I bet you’ve spent a lot of time either drying to dry-scape the joint compound off the knife or clean it under running water in a utility sink. Neither of which are nearly as effective as dunking the stuff and scrubbing it with a big brush. I can’t even tell you. I am so grateful that we have met a few professionals that are willing to teach us (okay me) the tricks of the trade. I TOTALLY feel you on the mud pan. I have manly hands for a girl and I still can’t quite get my hands around it comfortably. Don’t these tool manufacturers know of our awesomeness???? I want to plant a giant sloppy wet one on your cheek but that’d be way weird. So instead we’ll just go with the – THANK YOU!!!!!!!!! It’s not that I was doing it super wrong; mud pan – check!, mix it up – check!, use a big knife – check!, 3-swipe thing? wah wahhhhh… So that’s good to know. 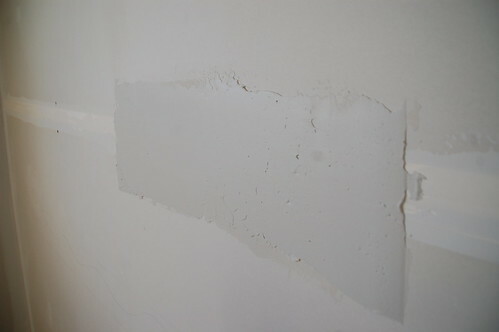 When i start to get crusties, I scoop that chunk of spackle up and put it right in the trash. Not worth the hassle of those #$*&*(@# lines. For the inner corners, I use a tool like this one – http://www.amazon.com/gp/product/B002Q8HH0U/ref=pd_lpo_k2_dp_sr_2?pf_rd_p=1278548962&pf_rd_s=lpo-top-stripe-1&pf_rd_t=201&pf_rd_i=B000FK41IC&pf_rd_m=ATVPDKIKX0DER&pf_rd_r=0W9WY1MS5Q6DES44549M. They come out a lot nicer than my previous regular knife/finger swipe combo. 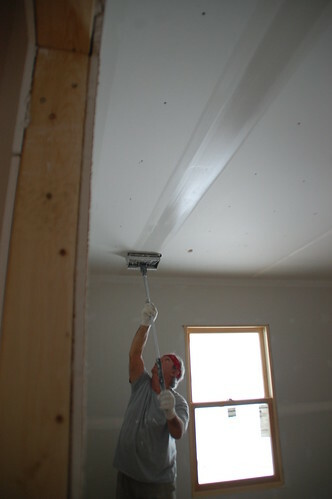 Yep, inside corner trowel = right tool for the job. And be sure to get a galvanized mud pan. The first tray I bought was plastic with a metal edge for scraping, but the plastic got so scratched up over time that it was hard to clean. When it comes to sanding, I’m a big fan of wet sanding (i.e., using a damp sponge). Breathing drywall dust and having it get everywhere, not so much. Use an anglehead instead of a corner trowel, it’s literally 10 times faster, it leaves a perfect corner and there is NO sanding at all. Use a stainless steel pan, not galvanized. 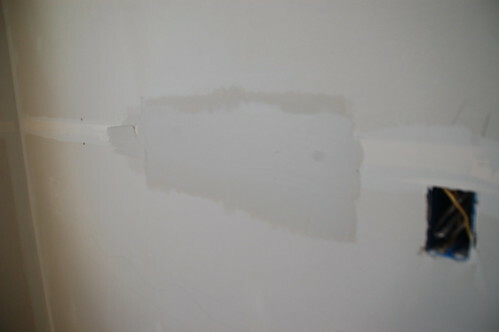 There is NO-SUCH-THING as wet sanding in drywall / taping. I’m a 2nd generation, 20 year professional taper, I do this for a living. I have a red seal ISM TQ. I have worked in the drywall business for 29 years. Striations – excellent word choice! We did this 20 years ago in our bedroom. Let me just say that heavy texture does not cover up as many taping/sanding sins as you think it would. But it looks like you have the technique down to make it all look great. I’m sure the real professionals love having someone who is capable and interested as a student. Keep it up – that light at the end of the tunnel is not a train! Perfect timing. What kind of compound did you get? 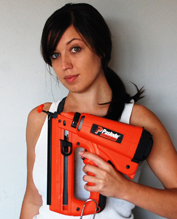 As I’ve mentioned before, I’m gearing up to drywall this weekend. Since the walls are small, I probably won’t have any seams, but will have to do all the corners and the area where the walls meet ceiling. I’m contemplating using that corner trowel, but I’ve been reading some pro forums and even the pros seem to have a hard time getting used to those. Have you done any corners and what did you use? Thanks! Not a pro, but I use a corner trowel. Two keys with it are (a) put a lot of mud in the corner to start (as per the joints above), and (b) apply firm, steady pressure as move the trowel down the corner. 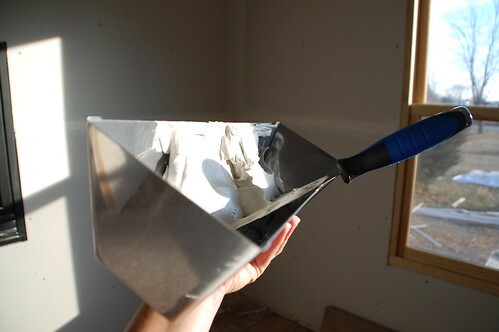 Depending on how much mud is in the corner, you may need to go over it once with the corner trowel, use the flat knife to scrape away some excess, then smooth it again with a 2nd pass of the corner trowel. 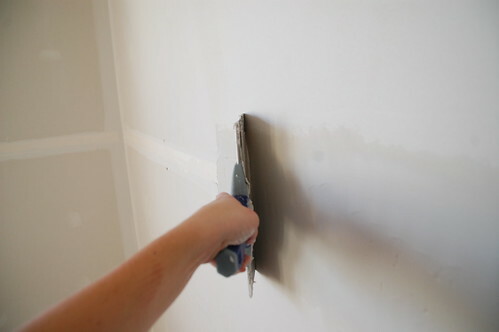 Luckily I haven’t had to do much inner corner work but I can say from experience that I much prefer to use the inside corner tool than a regular spackle knife. I’ve done it both ways (with & without that tool) and I always end up getting a little line down the middle of the corner when I just use the regular knife. The corner tool gives a nice smooth joint. Might take a little more sanding on the back end but I’m pleased with how it came out. Didn’t think it as that hard getting the hang of it. Thanks for those tips. You’ve given me some confidence to give it a try. If it looks funky, I can always scrape it off and try again. Thanks for the tips. The hubs and I consider ourselves pretty handy, but our first and only attempt at mudding was pretty pitiful. 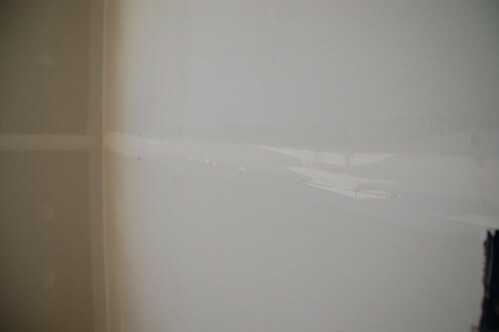 A groundwater leak (followed by another groundwater leak, followed by a burst pipe in the exact same spot) led to some soggy drywall in the corner of our basement. So we tore it out, sealed the leaks and did our best to patch it up. Lets just say we’re pretty glad that its a dark, mostly hidden corner. 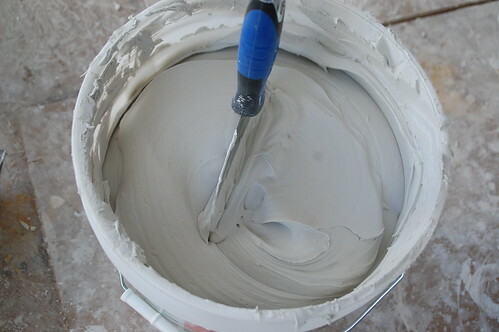 After reading these tips though, I’m confident that the next time we drywall/mud, we’ll have much better results. 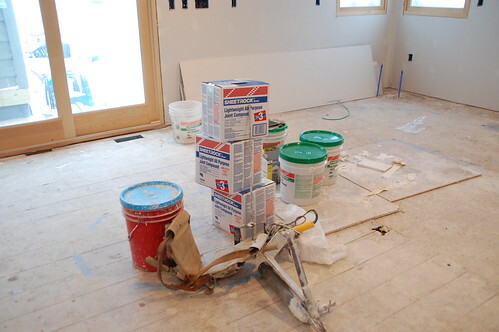 I had the benefit of being able to work with a licensed general contractor friend. We stood side-by-side while he showed me how to use the mud knives and then checked my method to make sure it was correct. One of the things that really helps with the 10″ knife is to bend it slightly. That way the ends are slightly above the surface when you apply the mud, and it makes it easier to feather it in. Otherwise,the tips tend to dig in from time to time. 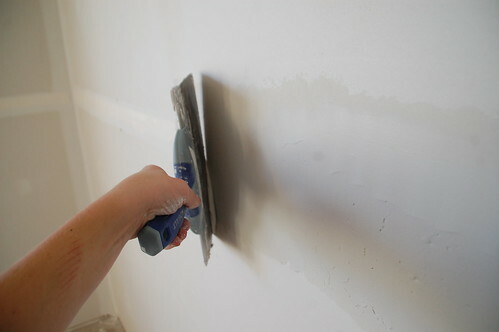 You can use a damp sponge when it comes time to sand out the seams, although with a particle mask and a long-handled hand sander with 100 grit sandpaper, it goes very quickly. The latter is the method I have used, but if the dust is a problem for you, the damp sponge method will definitely get the job done. Much more comfortable to hold, and a lot easier to keep all the mud wet (just scrape it back into a pile dead center every few minutes). Thanks for your comment. I had been debating on which to purchase…the mud pan or Hawk. I have only a small job but I am all about getting it done quickly and a professionally as possible. Besides, I believe tools are an investment. Even if you don’t have a future use for them, they can always be sold. First, I found this funny sentence to be a classic- “knowing there was a 2000 square foot house full of unfinished joints giving me the stink-eye.” Cracked me up. I guess the ole’ stink eye can make things happen sometimes though. You’ve got some good tips here, and good tips as well. The thing, besides the stink eye that makes it happen is being resourceful and having that I-can attitude. Great job! Superb article and easy to understand description. Could I link this post on my site. 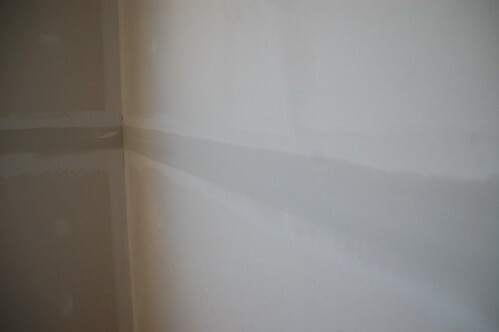 Can us smooth out joint compound like lime coat? I’m two year later into finding this article. I enjoyed reading it and finding many tips to help me with me my own bathroom project. Thank you for taking the time to write this blog. It was informative and educational. Seems I’m a bit late, but non-the-less great read. The “crusties” in the mud are the worst! Nothing like running a joint twice because of the little booger that was hiding on the knife. You definitely want to let each coat dry first (at least overnight) before the next one. Three coats is probably right for new walls. Best of luck with your project! addresses for the devices we used. exposed to. You can either lay it flat in shade or just hang it to dry. telecommunications network, radio networks and Internet convergence. perhaps feels much trendier. The belt cinched around the waist, or worn loosely around the hips can change the look of the dress completely. I must say you’ve done a very good job with this. Additionally, the blog loads super quick for me on Firefox. blog on regular basis to take updated from latest news. Should you find, negotiate and promote billboard leases and permits, then you haven’t any managerial duties past yur own time in obtaining them. I’ve savewd it for later! house to solve my problem. May be that’s you! Looking forward to peer you. When you learn to hook up to your very own higher power you launch stations for psychic visions. like as reading books, watching TV, browsing internet to play games and other entertaining activities when they are relax. It is also a healthier option than zero calorie drinks that are full of chemicals and often caffeine. foods at the right times. I found this site as a best website for latest updates. hopping around these tech-blogs trying to find out what kind of VPN I needed for i – Phone. not been addressed by Apple. With this temporary American IP address you can watch Hulu in Canada on i – Phone.